This is month 6 of my 7 month experiment changing my lifestyle into one aspiring for zero waste, making small changes on a month by month basis, until I have completely changed my habits using the ‘We Hate To Waste’ 7 steps to create a no waste mindset. – I have now removed all shower gel and hand wash in my apartment (ie used it all up) and replaced it with soap. Some of my visitors ask why I have soap rather than hand gel and when I explain to them it is for environmental purposes, most have never even considered it and many say that they will also change this in the future. I buy home made soap from a local market stall. – I bought everyone a non material Christmas present this year, meaning I didn’t buy a single material gift, these included vouchers to visit the zoo (for the kids), theatre tickets and restaurant vouchers. I received some non material gifts from people who knew I was involved with this which included a meditation course and amazon vouchers (to buy books for my kindle) I am going to keep this up for birthdays as well. – I took a takeaway meal to the theatre with me as we couldn’t eat everything we had for lunch in a restaurant before we went to see a show and we didn’t want to waste it, so I took it in with me! Luckily I don’t think anyone noticed! I ate the rest when we got home and it was delicious! – I am going skiing in Feb and I have bought all the ski clothes I need second hand from e-bay. I had an old perfectly good iPhone in a drawer that I had not been using, so I swapped the SIM card from my damaged iPhone for the one in the drawer and I got a case to protect it, as it is only a matter of time before I drop it. I gave the old, damaged iPhone back to the shop to recycle as it was way past its best to sell. Since its got really cold outside, I have started sleeping in a warm long sleeved t-shirt that I got from work, rather than throwing it out or buying something new to sleep in. I also watched this awesome YouTube Video which gave me loads of inspiration for my old t-shirts. I have refashioned 2 old t-shirts that I never wear any more and now use them for my yoga classes. I started to view items differently, to look at whether they could be used for any other purposes. I got inspiration from lots of YouTube videos I watched. – I used a Tupperware that I had got from a takeaway meal for a container to mix my hair dye in. 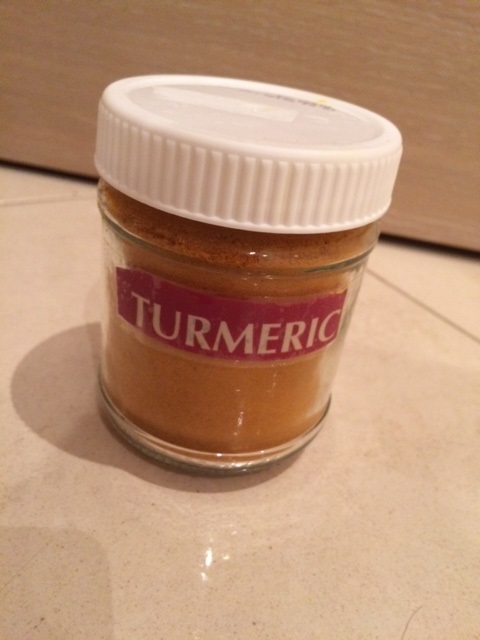 – I used several takeaway containers that I had got with takeout meals to store different items in my drawer in such as hair bobbles and nail varnishes. – I learnt how to make candle refills from my old candles in this great video, so I have saved all my old candles and I will make a new one with them, just as soon as I find out where I can buy candle wicks from in Budapest! 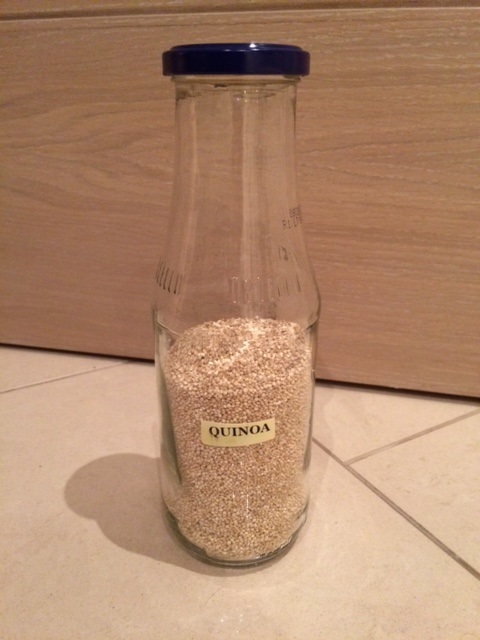 – I now keep all my old glass bottles and am one by one starting to store all my cupboard food and spices in them, rather than in the bags they come in. I used an olive jar, a nice shaped Dijon mustard jar and a glass bottle of passata so far, but I have plenty more food items that would be better kept in glass jars, so as I finish each jar, I will put it to great use. 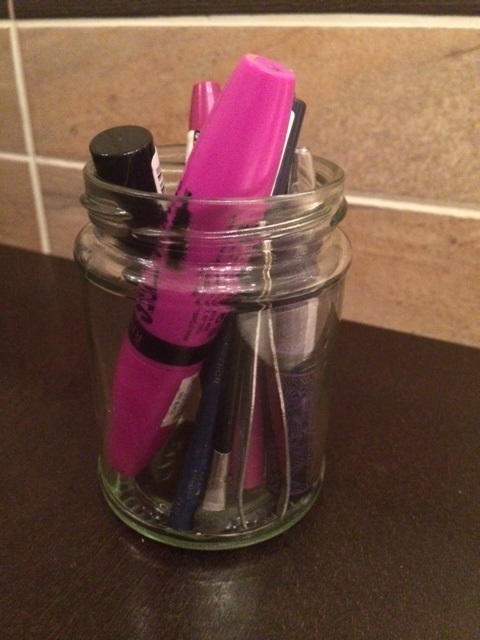 – I cleaned out a peanut butter jar and removed all the labels and now use it in the bathroom to hold all my makeup that was previously just loose on the side. – I washed out an old moisturizer pot that was finished and removed all the labels from it and now use it to store my rings in. The key thing I learnt is looking at everything differently and considering whether something could be useful and upcycled before recycling it. I got a bit addicted to watching YouTube videos on different ideas for upcycling! When products can no longer be used for their primary or even secondary ‘upcycled’ purpose, you can capture the embodied materials and energy by recycling or composting rather than throwing them away and sending them to the landfill. When I started researching this months task, I realized that there is a lot about recycling I did not know. I was not at all educated on it, so it has been really interesting learning more. There is so much information available on the internet. I found the RecycleNow site that gives a comprehensive overview. 3) Buying the new products made from the recycled materials. You can do your part every step of the way in all the 3 phases. Plastic items that are recyclable come with resin numbers that correspond to plastic type. You can decipher which plastics can be recycled in your area based on the resin numbers accepted by your recycling facility. Bottles, cans, paper, many plastics, and even textiles, can all be recycled at the end of their useful life. Recycle vigilantly. Make sure you know what is recyclable in your community and sort it properly. This is going to be different depending on where you live, but you can find all the information you need on the internet to tell you how to recycle hundreds of items and where the closest facility that accepts these items is located. Look for products and packages that are made from recycled materials. You can check the packaging and chose to buy products from recycled or partly recycled materials. Many companies encourage consumers to return their used products and packaging so that they can be recycled and they reward you for this. Return your printer’s ink cartridges back to Staples and get cash back on a reward card. Return six primary packaging containers back to M-A-C, and they will give you a lipstick FREE! Bring back 5 empty, clean black LUSH pots to your local shop for recycling and they will give you a Fresh Face Mask, FREE! Think that you can’t compost as you live in an apartment and have no outdoor space? Think again! Lauren Singer, of Trashisfortossers explains how to compost even when you are living in the city, with no outdoor space. Collect all your food scraps in a brown paper bag and store it in the freezer to keep bugs and mold away. Freezing compostable items also combats the waste from smelling bad. When your bag is full, find a spot in your city and add your compost to the pile. This guide explains exactly what you can compost and how to do it. I’d love to hear your examples of how you have repaired and repurposed in the comments below and whether you have any recycling advice for me for next months task.